Cindy Rodych. Photo courtesy of Rodych Integrated Design Inc.
From his engagement with the community, Gordon [High Commissioner Gordon Campbell], very much wanted to make Canada House open as it had been closed for many years with not very much life to it. His goal was to make it a working building again. So rather than having just formal [event] spaces, it would also have [day-to-day] workspaces in it. I was the lead designer on the project and that included everything from the planning to the heritage interventions that were made, as well as the furniture and, to a lesser degree, the artwork. Although for [the art work] there was a specific art committee that was responsible for the final selection. That included the High Commissioner and [Stantec Principal] Noel best. In the planning process we identified the locations where we wanted pieces and we gave direction in terms of the nature of the pieces; and then the committee began the search followed by a vetting process in which we were involved at each iteration. One of the things we did when we looked at in terms of the heritage aspects of the building was that all the exiting floors had been covered up. When we went through the exploration process of what was under this skin, we started to pull away what was terrible outdoor carpet and under it we found the [original] marble that we were able to reclaim. In some places where we were unable to re-use it, we reclaimed it for use elsewhere in the building. When we examined all the formal rooms in the old Canada House building, we selected the idea of reinstating wood floors, which would have been there originally. We then designed and added the application of parquetry inlays. Red oak is used and getting the quantity of material required was a challenge. It is stained dark to match the mahogany wood present in all the original doors and stair handrails. We worked with a Toronto-based company [Creative Matters] in the execution of these carpets. Some of them were made in Canada, all wool, hand-tufted. The ones that were not hand-tufted in Canada, were hand-tufted in Thailand. The carpet in the BC room [designed by lessLIE], you mentioned, was one made in Canada. All of the carpets in the various rooms are very distinctive and reflect the communities from which they come. With Canada being the largest wood exporter in the world, one of our themes was to highlight wood. We wanted to showcase the wood products for which Canada is known. In part, that is why we used wood as the integrating element between the two buildings. Although the two buildings are extremely different in character – 2-4 Cockspur having been gutted in the 80s so there was not a lot there from the heritage perspective – we knew we had to tie the two buildings together from a materiality perspective. 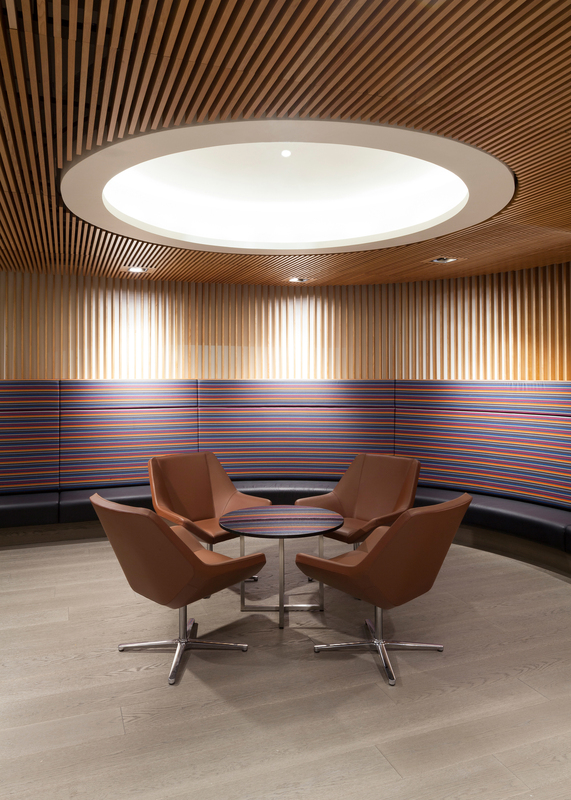 So we decided to use wood as the integrating element and it is used extensively on walls, ceilings and floors as well as in the bespoke furniture. All the wood in the [Cockspur’s Queen Elizabeth] atrium and in the [public business] entrance to the Cockspur wing is hemlock. We started with the Dept. of Foreign Affairs design group because we wanted to know which suppliers they had had experience with. We then did a scan of each of the provinces and because Stantec has offices in each of the provinces, I reached out to the interior design leaders in each of the provinces and engaged them in identifying bespoke craft people. Once we had identified those individuals, we then surveyed products they had made. [In addition] we identified other potential suppliers as part of the IIDEX show that year. We combined all this information and identified what we needed in terms of quantities of chairs, tables, etc. and where they would go. 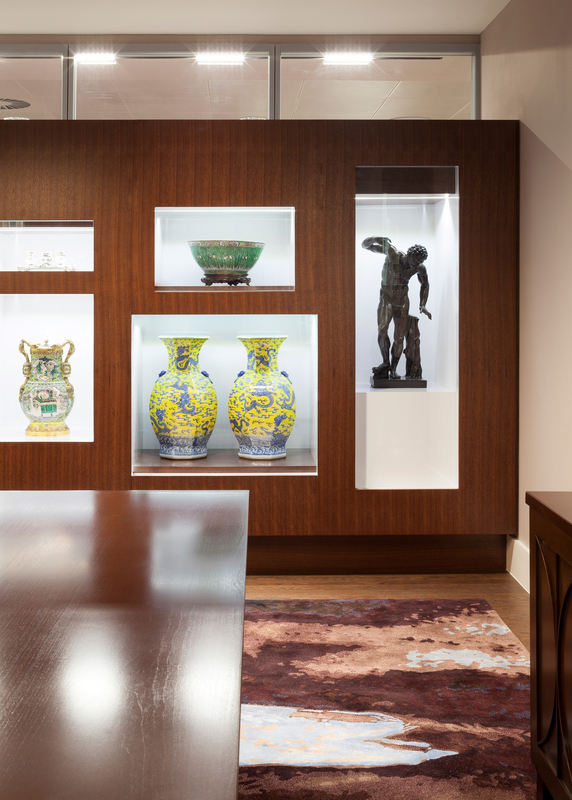 We wanted all the products for the formal rooms to be made in the province for which the room was named. We did that as much as we could; but, in some provinces there were no manufactured chairs so while we commissioned bespoke tables and credenzas the boardroom-type chairs came from Ontario and Quebec. All of the lounge furnishings came from manufacturers in the provinces for which the room was named. One of the original bespoke pieces in Canada house was the cast brass door handles with a maple leaf motif that were quite lovely. We recast about 100 more and distributed them throughout the building. A lovely heritage touch. Canada is known for its LED lighting and there are many high quality manufacturers of LED lighting in the country. In the Cockspur Building and in all the name rooms, we used contemporary lighting, all manufactured in Canada. Again, for example, the BC Room lighting was manufactured on the west coast. We then looked at manufacturers who could do bespoke lighting as well. 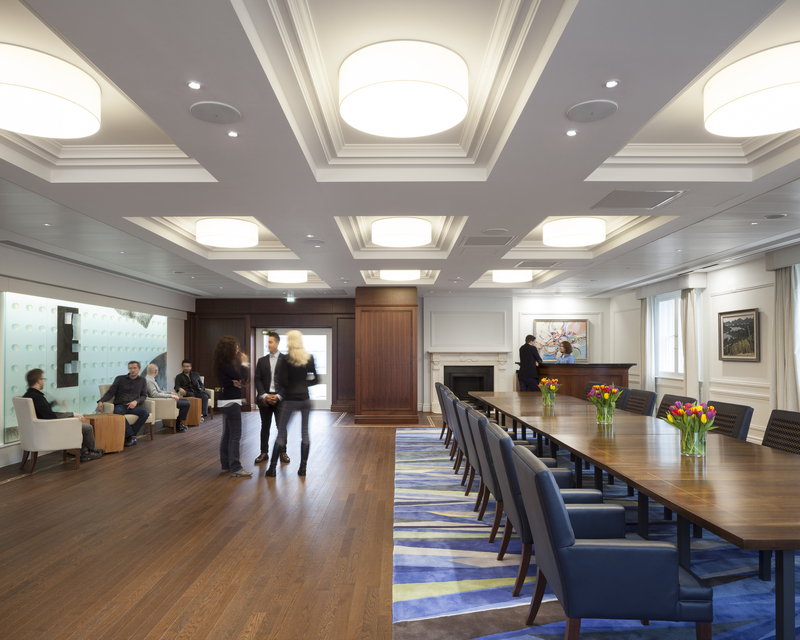 One of the manufacturers we looked at was AM Studio Lighting out of Toronto and they did custom fixtures in a number of rooms in Canada House including the Manitoba and Saskatchewan rooms [as well as] doing a custom fixture in the Ontario room that hangs below the skylight dome. The highlight is the [main staircase lighting installation] by Omar Arbel. We had anchored on his firm [Bocci] to do a custom piece there early on in the process. He had been commissioned by the Victoria Albert Museum to do a piece the year prior to when we opened. So we worked with him to conceive a light fixture that went through a number of iterations. 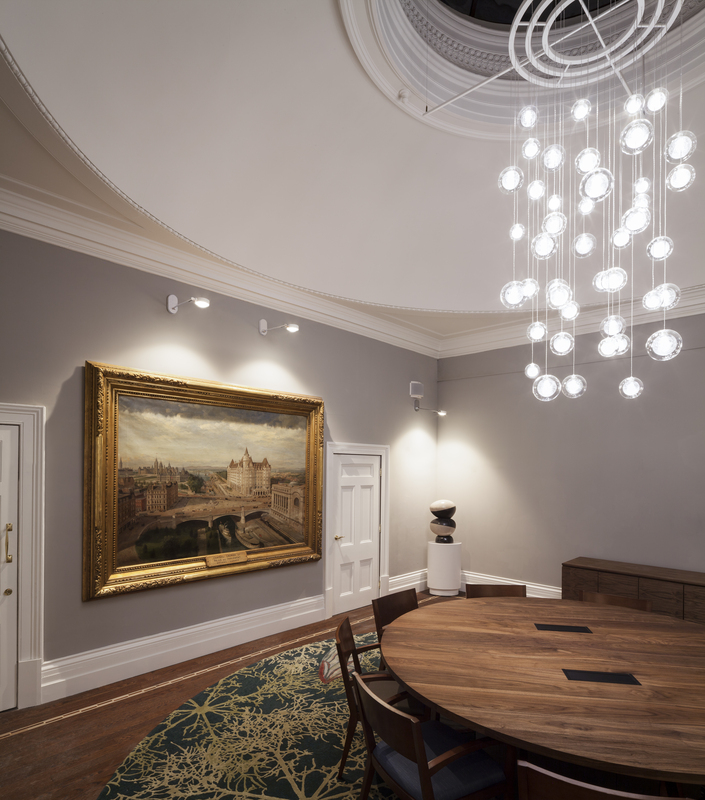 We wanted something that was quite different from what had been installed in the Victoria Albert, but was also “structurally quiet.” It has this snowflake-like element – although more amorphous than that – that cascades down through the staircase. We didn’t want to detract from the [heritage] staircase itself. The open office furniture is all Teknion, again a Canadian manufacturer. Nienkämper did a lot of the seating and the private office furniture with the exception of the High Commissioner (bespoke) and Deputy High Commissioners offices. Keilhauer also supplied some of the commercially manufactured furniture.